What Matt Kindt achieves in this second issue is utterly astounding. The first issue hooked me. This next chapter has blown me away. At once I see Aric and Harada as both heroes and villains. Naturally, I want to side with Aric because I know Harada is up to no good. I know that he’s the bad guy. But here, I found myself unable to not root for him and his team. Kindt’s script captures a complex moral world and, I think, is showing how sometimes the hero’s enemies actually sharpen and refine the hero (albeit painfully) into the sort of person he ought to be. The story is absolutely captivating. And even with major movements in the plot, the book still has quite a bit of characterization, particularly in Livewire and Ninjak’s characters. Doug Braithwaite’s art is explosive and emotive. He draws action with intensity. He draws emotions with intensity. He’s the perfect man for this book. 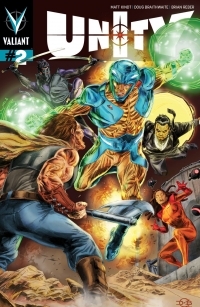 If you’re not reading anything in the Valiant Universe, you need to start now. This title is a great place to begin the journey. I’ve been sucked into this world of books and I’m not looking to come out any time soon.